Admit it or not, the vice presidential race won’t be making rounds all over if not for the controversies and controversial figures attached on it and one of them is Senator Ferdinand “Bongbong” Marcos Jr. This election, the late dictator’s namesake will make an attempt to restore the lost glory of his family’s name. With the enormous support from the youth who mostly were born in the post martial law years, will it be enough to catapult another Marcos to a position that’s just a heartbeat away from the Malacañan? 1. A veteran in the legislative and executive branches of the government. Spanning a total of a quarter century, Marcos held various positions in the government as vice-governor and governor of Ilocos Norte, as congressman of the province's second district and as senator, making him one of the most experienced political figures of the current era with excellent track record in public service. 2. Authored the Philippine Archipelagic Baselines Law (Republic Act No. 9522). 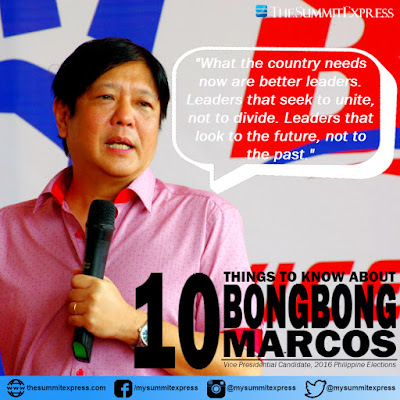 Once elected, Bongbong will be an inch away from the presidency, a post that the older Marcos held for two decades. While serving in the lower house of congress. The R.A. 9522 indicates the maritime jurisdiction of the Philippines which complies with the UNCLOS. 3.Transformed Ilocos Norte as first-class province. As three-term governor of the province from 1998-2007, Marcos intensively promoted the tourism of Ilocos Norte among local and foreign tourists, making the northern part of Luzon instrumental in pivoting the economy of the country as the province was able to acquire the attention of the global community in terms of generating profit and investments. 4. Yes to free market and passage of anti-dynasty law. Surprisingly, Marcos who comes from one of the most prominent political families in the Philippines voted "yes" for the passage of anti-dynasty law during the COMELEC organized vice presidential debate. 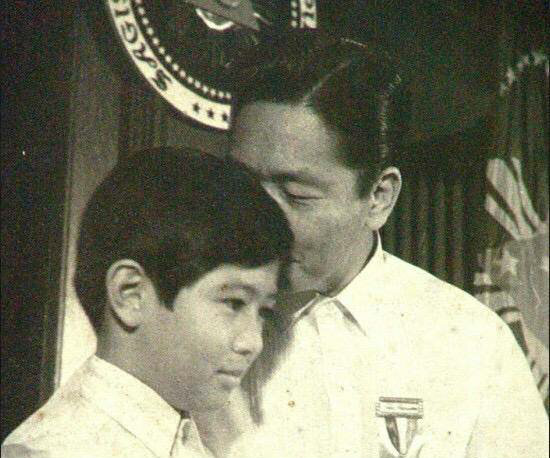 The young Marcos even bragged his role in including an anti-dynasty provision in the Sangguniang Kabataan Reform Law. Marcos is very much pursuant also to propel the country to a high performing free market economy. WATCH: Marcos’ opening statement during the VP debate (video courtesy of Inquirer.net Youtube account). 5. For mitigation of climate change. When the Marcoses came back to local politics, it was Bongbong who helmed the beginning of Ilocos Norte as an energy sufficient province. It was during his term that the province was hailed as a pioneer of renewable energy by constructing the now famous Bangui wind farm. Even today, Marcos believes that the Philippines should do more to combat the effects of climate change. 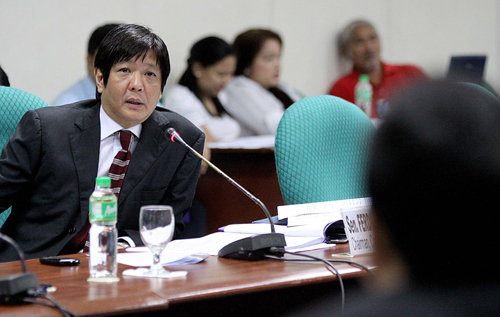 Marcos pioneered the establishment of the Philippine Youth Commission in 1992. It was his first ever law that he authored upon taking his role in the House of Representatives. It allows the youth to take a more proactive approach in nation-building and honing the future of the Filipino youth as effective leaders. 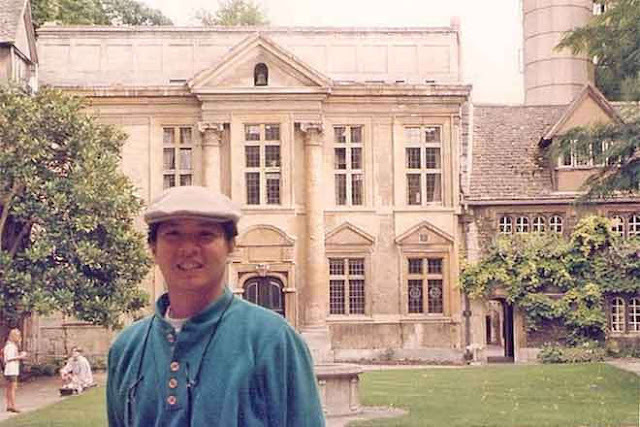 At a very young age, Marcos was envisioned by his family to take greater responsibilities for the country, thus providing him the opportunity to study overseas. Marcos graduated from the Oxford University with a Special Diploma in Social Studies. After that, he enrolled at the University of Pennsylvania's Wharton School of Business for an MBA program but failed to complete the said course as he had to come back to the Philippines to assume his post as Ilocos Norte's Vice Governor at a very young age of 23. Marcos was the author of 34 senate bills and co-authored 17 other bills during his tenure as senator of the republic in the 15th congress. So far in the 16th congress, Marcos already authored 52 bills and co-authored four. 9. Values the role of farmers and teachers in the society. By dedicating majority of his Countryside Development Fund (CDF) while serving in the congress towards the establishment of cooperatives, Marcos’ gesture was significant to help the workers of the grassroots sector to improve their lives. 10. Loves books, movies, his kids and the Beatles. Like his fiercest rival Leni Robredo, the 57-year old lawmaker is a book and movie lover and also has three children namely Sandro, Simon and Vincent. On his free time however, the senator also loves to download and watch films aside from reading books. Another reason why Bongbong highly revered not only by Ilocanos but a sizeable population of the public is that he's as ordinary like them. Bongbong is a certified Beatle fan, claiming that he has the best collection of the band’s records prior to the EDSA uprising. He even invited Beatle icon Ringo Starr to come back to the Philippines to patch up things between the government and their group. Aside from that, Bongbong knows how to cook sinigang and pinakbet, signs of a bona fide Ilocano!